RCSC-21 Rapid rate charger with two 90 minute charging wells. 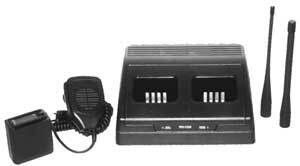 SMSC Speaker microphone with ear phone jack. LCSC Leather carrying case for belt mounting. WCSC Battery wall charger, 14 to 16 hours. BPSC1 1000mA NiCad battery pack. RDSCV VHF flexible helical-wound antenna. RDSCU UHF flexible helical-wound antenna. SCV125 12.5KHz conversion kit for SCV. SCU125 12.5KHz conversion kit for SCU. CCSC Cloning Cable (Dealers only). RDSCV PC programming kit (Dealers only).